Now that you’ve read the first two parts of this series, you’ve found the perfect location for your Christmas Tree and the perfect size for your Christmas tree, right? So let’s discuss how to decorate it. Pro-Tip: If you have a theme for your tree, evaluate all your elements before placing anything on the tree. Make sure they all go together, but aren’t too matchy, matchy. Lights, Lights and more Christmas Lights! Start with the lights and probably way more than you think you need. We recommend 100 lights per foot, which means a 10-foot tree needs about a thousand lights. Don’t forget that linking more than 3 strands together can be a fire hazard, so be sure to grab some green extension cords while you’re shopping. If you have an artificial tree that is in sections and you’ve already read our post about how to fluff your Christmas tree beautifully, then think about incorporating the addition of lights into building your tree. There are various methods to adding lights. You can drape, triangle or lasso your lights, but honestly, go with what you like best and have the patience for. Be sure you are lighting both the inside section towards the trunk and the outside towards the ornaments. For a professional look go for a single-color light, with possibly a second color tossed in occasionally. Multi-colored lights can look professional, but it’s much more of a stretch. Here is where you start filling the gaps. It may be helpful to turn the lights off so they don’t distract you as you get started, but somewhere along the lines, you need to turn them back on to truly evaluate. Choose your filler, whether it be floral picks, garland, ribbon or something consistent with your theme. Start by filling the larges gaps with your largest filler and alternate so it doesn’t look clumped together, then fill the smaller gaps with something complementary. Next, tackle the ornaments. You want to twist together smaller ornaments in sets of 2 or 3. Add ornaments in sections, being sure to use a variety of sizes, but for a traditional look, you should place your larger ornaments towards the bottom. Put cheaper ornaments closer to the trunk and reserve the more expensive ones for the outside, upper middle part of the tree (eye level). Pro-Tip: Separate your ornaments by size, so you can see what you have used and have left (this also might keep your little helpers occupied as you’re adding lights and filler. For a truly professional look, you should tackle things well below eye level too, like your tree skirt and gifts. I think Sara D. at REMODELaholic (link https://www.remodelahu olic.com/decorate-christmas-tree/ ) put it best when she likened the tree skirt to the shoes in an outfit. It should be complementary, but not overpower the tree. Finally, check out your gifts. Hopefully you took our advice on ‘How to Enjoy December’ and started wrapping them early. Try to use coordinating wrapping paper to match your style or theme. We recommend using no more than 3 colors of paper and 3 colors of ribbon to keep things simple. So there you have it! 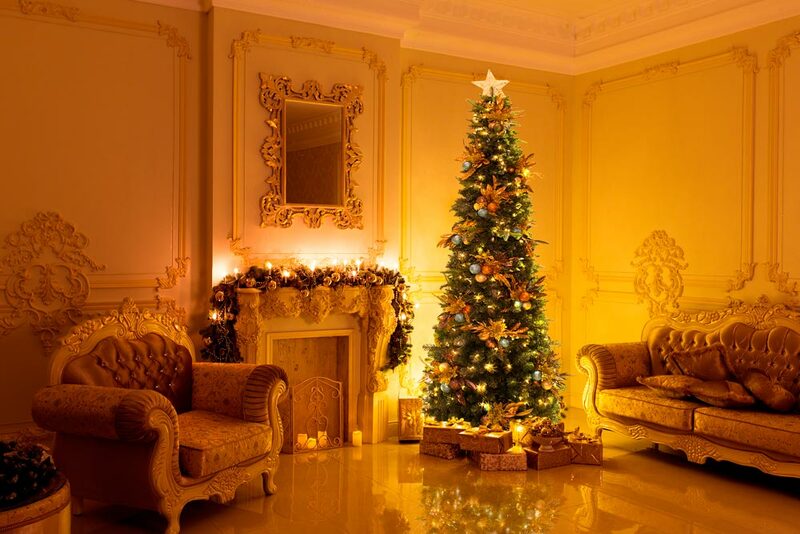 All of our tips, tricks and technical suggestions to have the perfect Christmas tree. We know all about how much work it takes to make things picture perfect, but with some planning and a few small touches, you can have a tree that is magazine, or should we say Pinterest worthy this year.